Thursday morning we awoke to pouring rain. We had ridden Wednesday in a light rain all day and had thoroughly dried off Wednesday night. Now the forecast was for significant rainfall for the next couple of days. We decided to push on since we had confirmed with a church in Glendale that we could stay inside and we had a fairly short mileage to complete if it kept raining. Into the pouring rain we rode and kept on following the Trans-am signs (see above) that we had seen at every intersection since we entered Virginia. 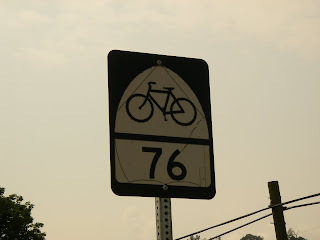 The 76 stands for 1976 the first year the route was ridden in celebration of the bicentennial. Well we were thoroughly drenched before we reached Mechanicsville on one of the small county roads. We stopped for lunch as the rain let up for the rest of the day. 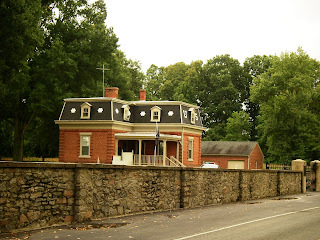 The route had us skirting Richmond to the northeast and we soon came upon the signs marking the Civil War battlefields and recounting the battles that occurred before the fall of Richmond. One of the battlefields we passed was Cold Harbour where 17,000 were killed. There were 7 days of battles around Richmond and it was clear that the North had surrounded Richmond by the location of the battlefields. This house served as a battle headquarters and the church we stayed in had served as a field hospital for the Confederate army. 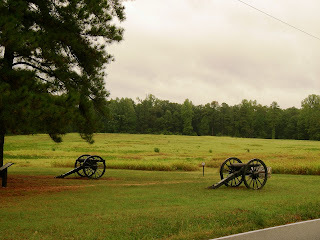 Friday morning we headed east from Glendale and joined Hwy 5 headed for Williamsburg. The riding was incredibly easy; the coastal plain of Virginia is flatter than Kansas! Along the James River we passed the old plantations from the early days (1726 +) and soon reached Williamsburg. We're resting today and taking care of business at the post office. Tomorrow we go to Yorktown, site of the final battle of the Revolutionary War in 1781. Great journaling and pictures. We've been lucky enough to travel in that part of the US and the history makes you stop and wonder. Belinda, I'm not sure I want to know what a bologna burger is but it sounds pretty scary. Hopefully you guys are not in danger of encountering any hurricane activity as you head East (like the big one currently threatening the Gulf Coast). Just back from Italy and catching up on your travels. I want to be the cookie lady when I grow up!!!! What a great way to live your 80s. I can't wait to hear the stories you collected from her. Thank you Jon, we are enjoying some great seafood. Diana, thanks for the compliments. When I was a kid I made fried bologna sandwiches, the burger is similar, only with thicker bologna. No danger from hurricanes yet, but it looks like things are really getting wound up in the Caribbean. One storm after another. Bill, Beel, Leslie, everyone, we've made it! Coast to coast. See latest blog post. It's hard for us to believe. We've cycled 4000+ miles. Carolee, June Curry (the Cookie Lady) is a special ol'gal alright! and much beloved amoung touring cyclist. I'm sure you can find hundreds of articles if you google her name.